At least 17 people, including a child, have died in a Delhi hotel fire that broke out early on Tuesday morning, police said. The dead included a woman and a child who tried to escape by jumping from a fifth-floor window of the 65-room hotel in the shopping district of Karol Bagh. Fire officials said a call about the fire was received at 4.35 am and 24 fire tenders were rushed to the spot. 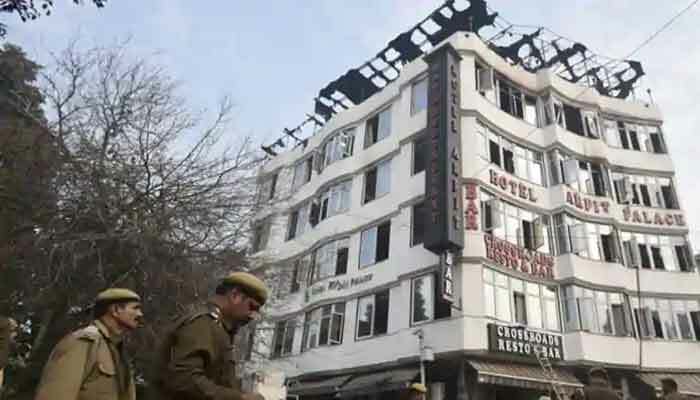 As per the deputy chief fire officer Sunil Chaudhary, 26 fire tenders were rushed to the spot and also said that 25 personnel were evacuated from the hotel. The tragedy comes just two months after six people were killed and more than 100 injured when a fire broke out at a hospital in Mumbai in December. Those staying in the hotel included a group of tourists from Myanmar, broadcaster NDTV said, adding that authorities were trying to ascertain their whereabouts. "We have ordered for a magisterial inquiry into the case". Rescuers are now focusing on those still trapped inside hotel rooms.